The "4Gentlemen" at Exile Diary have created augmented reality apps for smartphones with scenes of the 1989 student movement. Deploying Augmented Reality application, Layar for Android and iPhone, we have created virtual 'Statue of Democracy' and 'Tank Man,' and installed those monumental icons on the physical sites where the real incidents took place. Any visitor, domestic or from abroad, can find those virtual monuments on Tiananmen Square and nearby East Chang'an Street with an iPhone or Android mobile device, as well as taking picture with them. 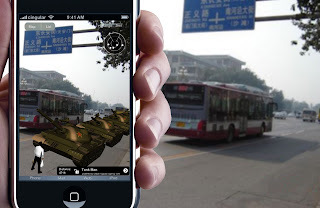 The images above indicate the real incidents, making process of Statue of Democracy & Tank Man (F1 & F3), the Augmented Reality on mobile devices (F2 & F4), and the exact locations of the AR work on Google map (F5). 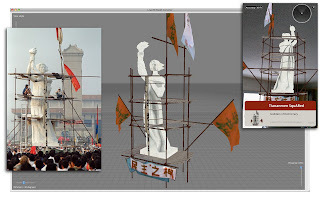 Once the audience downloads the Layar Augmented Reality Browser to their Android or iPhone, he or she could stand in Tiananmen Square and point their device's camera towards the northern side of the plaza where the Goddess of Democracy was originally erected. The application uses geolocation software to superimpose a computer generated 3D graphic of the Goddess of Democracy at the precise GPS coordinates of the original, enabling them to see the augmentation integrated into the physical location as if it existed in the real world. Similarly, the Tank Man augmentation would be placed on Chang'an Avenue northeast of Tiananmen Square in the exact location of the original event. Both augmentations will appear in the original scale and orientation. thanks. great book, great blog!